1968-04-21 Columbus, OH Veterans Memorial Auditorium – 7:30pm. 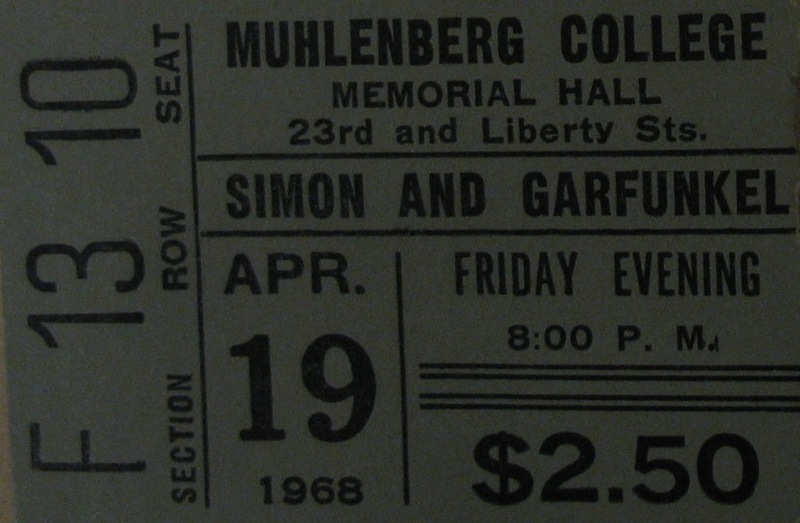 I just found a new date Saturday 20 April 1968: Ithaca, NY Cornell University Barton Hall. thank you Joe for the new informtion you have sent recently.It’s very much appreciated. I have a ticket stub for that concert. thank you for the update. I will change it accordingly in the list. *This is a correction for this date previously listed at Eugene, OR. There isn’t much coverage of this concert, and I was wondering if you had any info whatsoever on said concert — any confirmation? How could I have forgotten to add this one to the list? Thank you for mentioning it and bringing it under my attention. So far nothing in the press about this concert has been found. I have concert in Burlington in the 1967 calendar, if you you google it there’s also a mentioning for a 1969 performance. I will keep an eye out for more information, sure! Hello – I’ve found a new gig for 1968: Saturday 3 February San Diego Community Concourse. Joe, thanks! As a high school kid, I attended the 2/3/68 concert with my now-wife Linda. If you please, where and how did your detective work uncover this overlooked event? Sunday 21 April Columbus, OH Veterans Memorial Auditorium – 7:30pm. It appears there was no review of this show. Thanks for the useful information on these gig dates. I remaster live gig recordings found on the internet, and with a little studio magic, make them sound as great as possible – then broadcast them on internet radio. 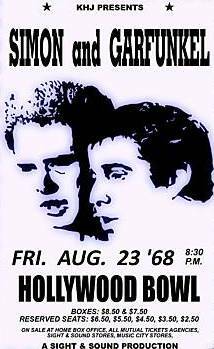 I have chosen a great S & G recording which exists of the Hollywood Bowl show from 1968 for my next show. The station is Radio Happy, on the web at http://www.radio-happy.com and also available on the TuneIn app for phones and tablets. This show will be on the air on Tuesday 27 August at 7pm UK time with an hour of 60s tunes; the S & G show will then start at 8pm. A free download link will appear a few days later at http://flipmartian.moonfruit.com/#/live-and-loud-shows/4576208745. I hope this is of interest. The review mentioned that 7,074 people attended the performance and hecklers caused some problems at the beginning of the show but eventually were won over. (citation: Dallas Morning News Sat 13 April 1968, section A, page 16. It appears there was no review of the show in the Dallas Morning News, there may have been one in the University student newspaper. 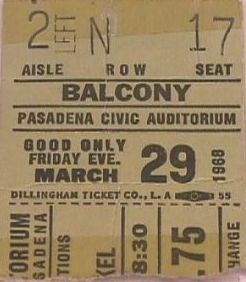 The show marked: 1968-05-08 Davenport, MI, Davenport College, Civic Auditorium, was actually February 8,1968 and was in Grand Rapids, Michigan not Davenport. The show was sponsored by Davenport College and Grand Rapids Junior College. It was held in the Civic Auditorium. This information can be seen on the ticket scan. Thank yopu fopr your info. I mis-typed the date into 05 as it seems. But now I have been able to change it with the correct city too. Much appreciated. One last point. The venue had nothing to do with Davenport College. It was the Grand Rapids Civic Auditorium. Davenport was just a sponsor of the event. I have added the sponsorship too now. Were you there at that concert? I saw them at St. John’s arena in Columbus, Ohio. It was my very first concert (I was seven!) and I remember that someone boo-ed something they said and my father yelled, “For shame!” I learned to harmonize from listening to their albums and those of Peter, Paul, and Mary. So excited! I have looked everywhere for the date/location of the concert I went to when I was about 16. (1968-69). It was either TCU or SMU, and was the most magical time. Small crowd, just the two of them and their guitars. 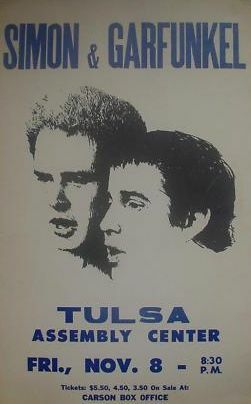 I think the 4/13/68 appearance mentioned above was the one I went to….does anyone know if they also appeared in Fort Worth at that time? Not everyone knew about them, so, it may have been the smaller TCU venue at the college. Any pics of tiks, etc? Thanks! 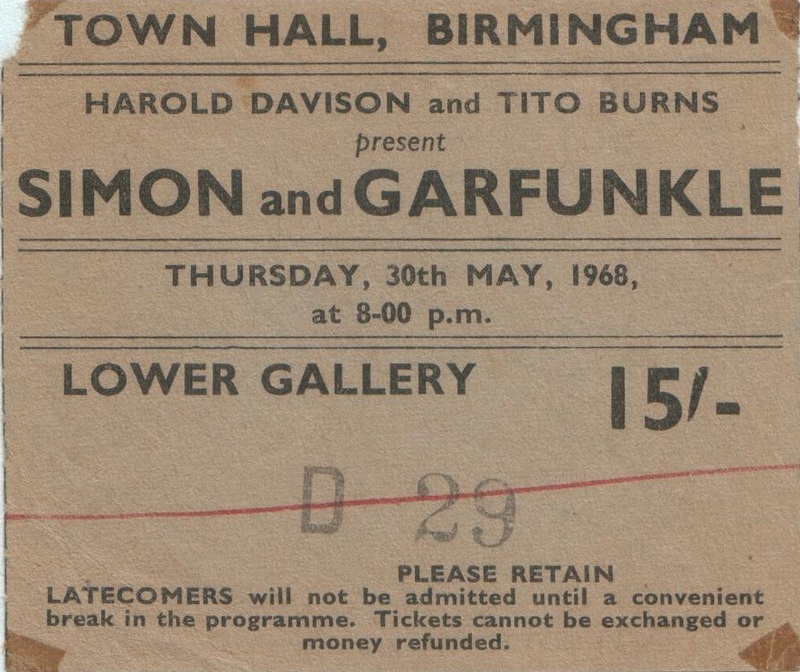 Hi – Not sure if anybody else has mentioned this, but although the Royal Albert Hall gig on 8 March ’68 was indeed, as Billboard described, sold out, it didn’t actually happen – it was cancelled at (very) short notice because Art was ill… The later date at the same venue (31 May) was introduced to compensate. Yes you are so right. So the July concert I mentioned (without the day) is better changed into May 31st. I will do that. Thank you for your comment. Saw the Athens, Ohio concert in October 1968. Wish I had the ticket stub! First live concert I ever saw at age 18! It was great! I blog quite often and I really appreciate your information. Your article has really peaked my interest. I’m going to book mark your website and keep checking for new information about once per week. I opted in for your Feed too. Well I am glad with all appreciation. Thanks. I saw S&G at Merriweather Post Pavilion (Columbia MD) in August 1968 but cannot find any website listing that concert. It was mentioned briefly in articles about the 50th anniversary of Merriweather last year but somehow is left out of S&G concert listings on SetLIst.fm and Paul Simon’s website among other sites. Does anyone have more information about this concert to include the actual date? Rick, I have to update my listings at the blog, which I hope to do second part of coming May. …was in Sacramento, California. I was there. Met Paul and Art at Freeborn Hall in Davis before their show the following day. You have the handbill/poster for it already, several items below the date. It is the one that’s mostly green and yellow. I beg pardon. Part of that last post was inaccurate. I wasn’t at the Feb. 4 1968 concert at Memorial Auditorium. It was the April 8 1967 concert that I saw at Memorial Auditorium. 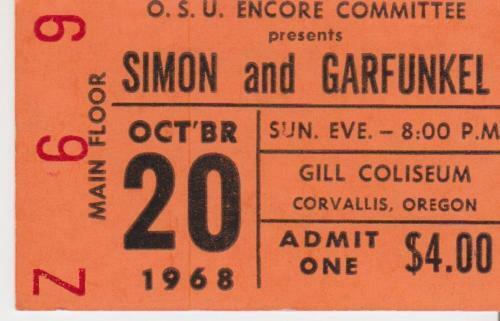 The show at Freeborn Hall in Davis was the next day, April 9 1967. Hello Bob, thank you for the info you sent. Much appreciated, as all info from people who were actually at these shows. I changed the list immediately. I have still some 100 concerts to add the list, which I will do soon now.